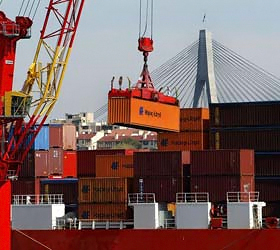 The Karachi Port and Port Qasim handled a cargo volume of 180,328 tons during the last 24 hours that included 113,364 tons of imports and 66,964 tons of exports, the two ports reported on Tuesday. Accordingly, the Karachi Port handled imported cargo, including containerised cargo (6,440 tons), bulk cargo (4,500 tons), coal (14,000 tons), and oil / liquid cargo (11,500 tons). It handled exports, including cement (1,941 tons), containerised cargo (22,741 tons), bulk cargo (140 tons), and oil / liquid cargo (17,850 tons). Moreover, Port Qasim handled imported cargo, including diesel (48,905 tons), palm oil (6,700 tons), chemicals (2,319 tons), and containerised cargo (19,000 tons). The port handled exports, including rice (1,548 tons), cement (3,794 tons), wheat (4,130 tons), and containerised cargo (14,820 tons). Berth occupancy was measured at 50 percent at the port on Monday, the PQ reported. During the last 24 hours, it berthed three ships, carrying containers, palm oil, and diesel. Another four ships, carrying palm oil, cement, rice and containers, also arrived at the outer anchorage of the port during the last 24 hours. With this, a total of seven ships were moored at the port�s different berths. They loaded and offloaded wheat, rice, cement, chemicals, palm oil and diesel, the PQ reported.